Playing at the indoor playground is fun for Yasya, but it is better when she has a playmate like what you will see in this episode of her kidblog. Watch how they ride motorcycles, go through an obstacle course, slide down, and jump in a trampoline. Hear nursery rhymes like Skip To My Lou and Baby Shark while watching this episode. 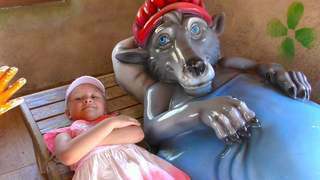 Free videos about Yasya and her playground adventures are available to watch for free when you visit Kivitu.com.